You are currently browsing the tag archive for the ‘dvo’ tag. Although the nurse told me last week that my BMI was spot on, being the owner of the B in question I can say that my M is excessive. Evidence: my belly has started wobbling when I run. Let’s hope it’s just the combined effect of Xmas and snow getting in the way of my meagre level of physical activity. It’s the Ultra-O event otherwise known as the Midlands Champs next week, and this week I’m making an attempt to put some practice miles in: Calke yesterday, Sutton on Wednesday and Baggeridge on Thursday. Now, I’m going to whisper this so that I don’t offend anybody, but Calke was one of the worst O events I’ve ever been to. 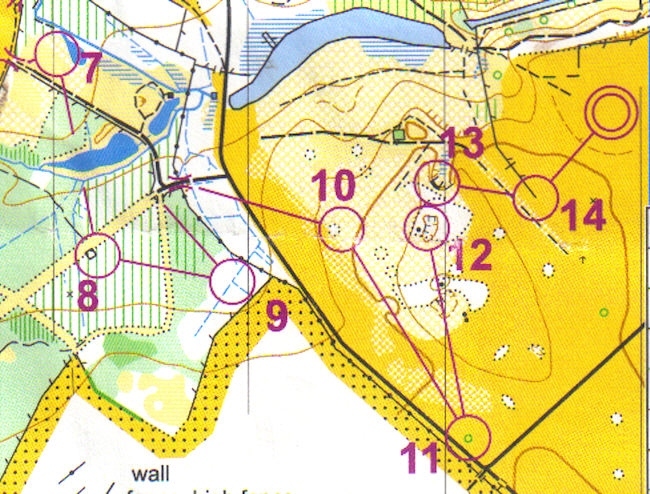 Nothing wrong with the club, the mighty DVO, or the event organisation, but Calke Park is an unpromising venue, and any enjoyment there might’ve been from the running was removed by the legs that went through knee-high brambles. Seems like the days are over when simple bramble-bashers would do: nowadays it would be best to head out to the start in a brambleproof suit. Another problem was the blanket ban on climbing walls and fences. After control 1 (on Green) the fence was in quite a bad state of repair but I was a good boy and went round; I bet not everybody did. A clearer example is leg 9-10: it’s obvious from Winsplits that some runners cheated here. It’s hard to blame them.